Formulated without soap and enriched with soothing white clay, Cattier Organic Soap with Rose & Apricot produces a soft and creamy foam that gently cleanses and respects the skin’s natural pH. With its seductive soft and delicate flowery fragrance, Cattier Cleansing Gel for Hands carries you away to a fascinating garden. 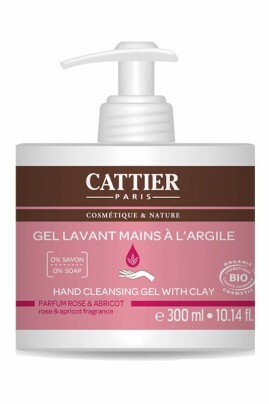 Cattier Organic Hand Cleansing Gel Rose and Apricot smells so good ! Apply a dose of soap to wet hands, lather and then rinse with tepid water. Only natural composition to care of your sweet hands !